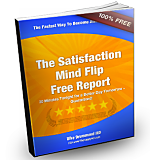 In this post I will show you a shortcut to more happiness in your busy life as a physician … by teaching you how to overcome your doctor programming and build your own personal Venn Diagram of Physician Happiness. The happiest doctors I know understand there is a Venn Diagram for career satisfaction. By conscious planning or sheer luck, the happiest doctors have maximized the overlap of the two circles of the Venn. Right now you probably only see one of the circles. 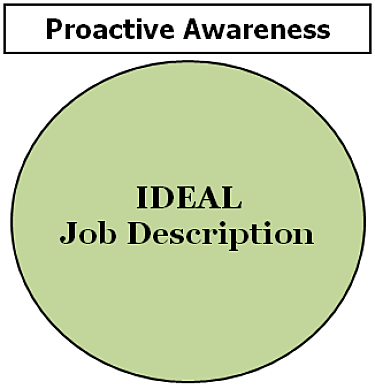 Let me show you the second circle that will serve as a springboard to more happiness in your career. Most physicians do not know this Venn Diagram even exists because of the programming of our medical education. This hole in our collective awareness is one of the big reasons for physician burnout rates of 33-80% in recent surveys. We are trained to see problems and react to them. We diagnose and treat … and have spent decades perfecting this thought process. It is the basis of what we do as a physician … however it is not a solid foundation to build your life on. It is no way to become one of the happiest doctors. 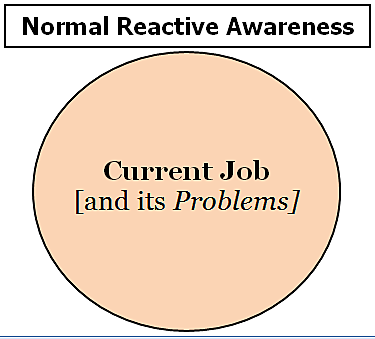 Our reactive problem solving mode means we only see one circle … it looks like this. Knowing all the things you don’t like about your current position is important … and the happiest doctors don’t stop there. You can solve every one of these issues and still not build your ideal job. Here is the main point I want you to see. 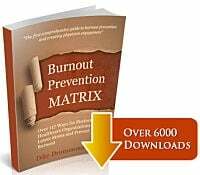 Our reactive, problem solving mode creates a huge blind spot that blocks most doctors from more career/job satisfaction. I know this seems obvious now that I point it out. 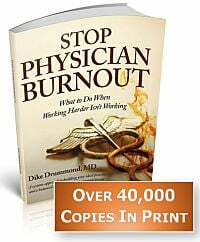 And I have worked with hundreds of overstressed physicians now and not one of them has ever had a written Ideal Job Description, until I gave that to them as a coaching assignment. Notice that this is a 180 degree shift in your focus — from solving a problem with our doctor skills, experience and programming — to clarifying what you REALLY WANT. You may have to overcome a bunch of inner “gremlin chatter” to give yourself permission to make this list. That is normal. We are programmed as doctors to put our needs/desires/wants/preferences dead last. You can change that right now. I encourage you to grab a pen and paper right now and begin your first pass at your Ideal Job Description … and be as specific as possible. Write it ALL down and keep the document handy so you can add to it in the days and weeks ahead. 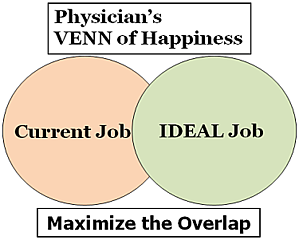 Once you know what you REALLY WANT you can create your own Venn Diagram of Physician Happiness and take the next step … work to maximize the overlap in the two circles. That is exactly what the happiest doctors have done. This is the task of the interview – for you to ask the questions you need to understand how much overlap there is between this position and your ideal job description. Once you understand your Ideal Job Description and can clearly see the amount of overlap between it and your current job/career … you can begin to take simple steps to increase the overlap week by week. BTW, the smaller your initial steps, the better … until you get some momentum going. - Ask the question above, "In an ideal world, what would my practice/job/career look and feel like?" - Notice your Venn Diagram and ask yourself this question, "what is the amount of overlap between my current job and my Ideal Job?" - Give it a number ... how many PERCENT is the overlap right now? BTW, 10 - 30 % is not good. If you are not burned out now, you soon will be. And 60+% is quite good. You can still use your Ideal Job Description to make it even better. PLEASE LEAVE A COMMENT and let us know what your level of overlap is now and what you intend to do about it.